PUNTA ARENAS, Chile — In a perfect world, IceBridge researchers would make science flights over Antarctica almost every day and return home with a check next to every high-priority science flight. 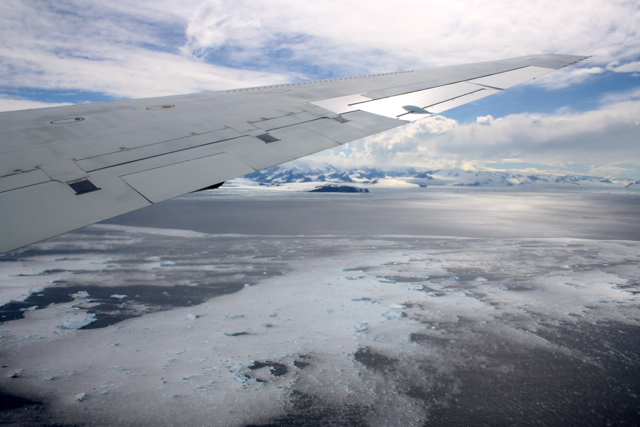 The 2009 campaign — the first year IceBridge made flights over Antarctica — was just about perfect. 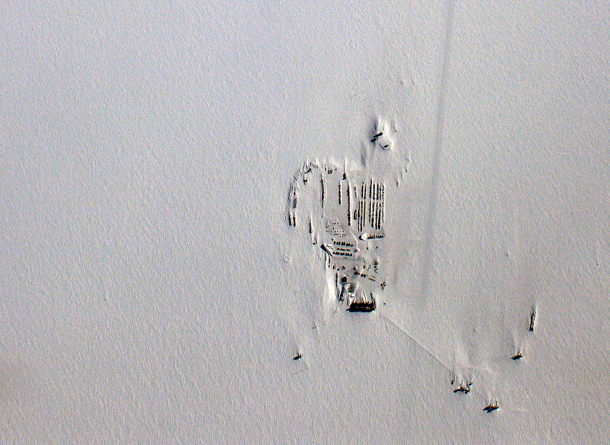 But that’s a rarity in Antarctic research where whether and unanticipated aircraft maintenance can ground flights. During days on the ground, however, researchers keep busy. 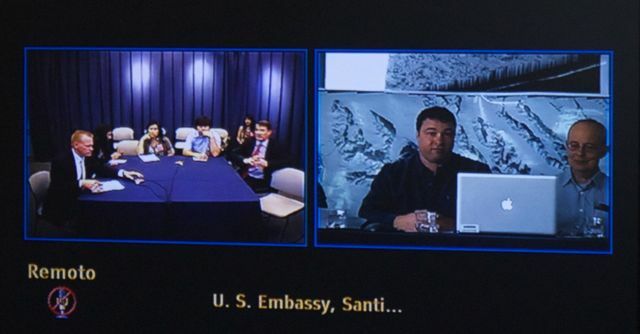 On Monday, Nov. 15, IceBridge scientists gathered at Universidad de Magallanes in Punta Arenas, Chile, to answer questions from local reporters and from reporters in Santiago via live video feed (video below). PUNTA ARENAS, Chile — Friday evening, IceBridge teams gathered in the hotel conference room to discuss logistics for upcoming flights. First up: weather. The audience watched the animated WRF model, a tool used for flight planning because it tells you what the weather will be like in the next 6-12 hours. On this particular morning, the model showed system after system lined up to pummel Antarctica. “Are we sure this isn’t the WTF model?” a scientists inquired. Saturday morning, scientist and flight planner John Sonntag arrived at the airport offices with the flight decision. Weather conditions weren’t perfect, but were the best the Antarctic Peninsula had seen in a month. Given that it had been a few days since the last flight and the forecast looked to only worsen in the days ahead, mission planners decided to take the opportunity to fly under the cloud ceiling. The model predicted clear skies below 10,000 feet. “I hope they’re right,” Sonntag said. The flight planners quickly worked up a modified version of the “Pen 23” flight plan and at 9:23 we took off for the Peninsula. We flew the planned route backward, hitting northern cloud-free regions first. Heading south, we followed the eastern side the “spine” — the crest of a mountain range that extends down the middle of the Peninsula. Unfortunately for stomachs, the spine influences weather patterns and the east side also happened to be the windy, turbulent side. The DC-8 may need to restock the little white bags! Stomachs also suffered from the dramatic changes in altitude necessary to collect data. The measurements require a relatively consistent altitude, which can be tricky when accessing a glacier behind a rock cliff. But the pilots deftly handled the 7,000-foot-roller coaster flight line to collect data over targets also surveyed during the 2009 campaign. Targets flown: Hektoria, Drygalski, Crane, Flask and Leppard. Each of these glaciers drain into the Larsen A and B ice shelves which broke apart in 1995 and 2002, respectively. Attlee, Hermes, Lurabee and Clifford. Each of these glaciers drains into Larsen C, which is still intact. So what? 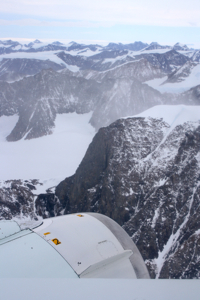 Like a cork in a bottle, ice sheets can plug the neck of a glacier. Remove that ice shelf and the glacier more freely dumps ice into the ocean. Scientists want to keep an eye on how these glaciers continue to respond years and decades after the loss of the shelves. Crane, for example, which feeds into the remnant of Larsen B, shows little sign of slowing down. Cruising further south, however, we encountered too many clouds so we cut across to the west side of the spine to check out the Fleming Ice Shelf. Clouds there also proved too dense, however, so we turned north back to Punta Arenas. At 8.4 hours, the modified Pen 23 became the shortest flight of the campaign — to the relief of many yellow-faced passengers. 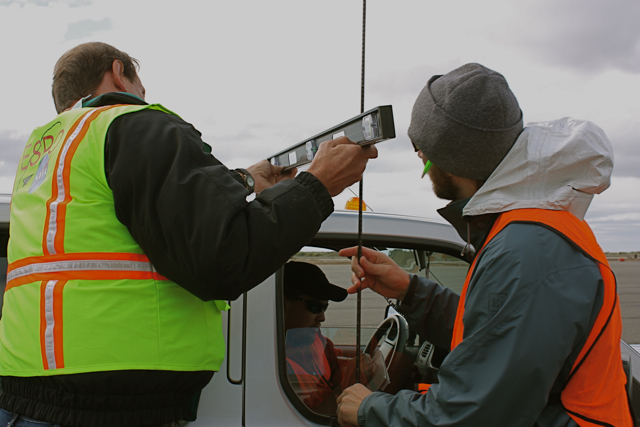 Dave Jordan (NASA ARC), Kyle Krabill (NASA WFF) and Matt Beckley (NASA GSFC) affix a GPS antenna to a pick-up truck for the three-hour Operation IceBridge car survey. Credit: Sarah DeWitt, NASA GSFC. PUNTA ARENAS, Chile — Today marks the end of Daylight Savings Time in the United States, but the clocks remain unchanged in Punta Arenas. Just 18 hours after setting foot on Chilean soil, I was packing my bag at 5:30 this morning for a DC-8 flight over Pine Island Glacier. I thought that was an exceptionally appropriate first foray into the IceBridge mission, considering that Pine Island is one of the few Antarctic features I know quite well. Alas, the IceBridge team and I will keep our feet on the ground for at least a few more days while we wait for a replacement airplane part to be delivered from California. The news came over breakfast as the team prepared to fly for a fourth day in a row – a welcome stroke of good luck now put on temporary hold. While the DC-8 team hustled to get the part shipped on the next available plane from L.A., others shifted their focus from the air to the ground. The ground calibration team is really just one person – Kyle Krabill, engineer at NASA’s Wallops Flight Facility. This morning Kyle took advantage of the DC-8 downtime and set out to create a topographic map of the airport ramp. This type of map is called a “car survey” because it involves a three-hour journey criss-crossing the rectangular speck of pavement at a maximum speed of 5 miles per hour. The entire area is only about 200,000 square meters, but it varies in elevation by a factor of about one meter. 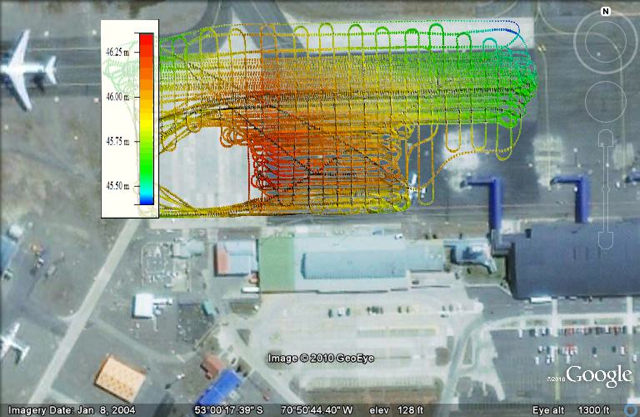 An accurate elevation map of the ramp is critical for calibrating IceBridge’s airborne instruments. Kyle’s goal is an elevation map with centimeter precision. He starts his car survey by attaching a GPS antenna to the top of a car. He carefully arranges all of the equipment and passengers before the survey begins, because even a slight difference in weight can affect the measurement. Would-be passengers must commit to the three-hour road trip or be relegated to watch from the sidelines. After several days without flights due to unfavorable weather over Antarctica, the Operation Ice Bridge DC-8 is in flight supporting its latest mission. The mission today is the LVIS 86 pole flight. 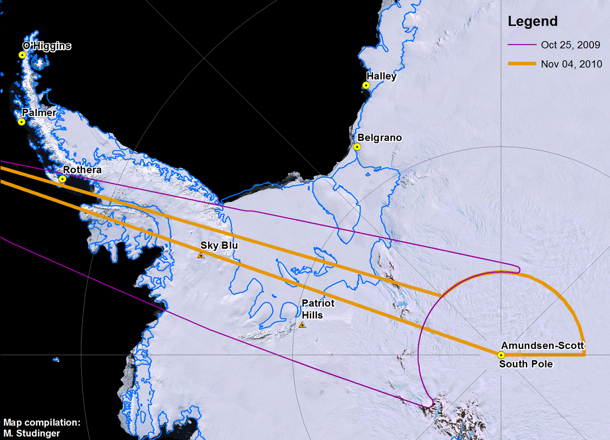 It’s a long 12-hour mission during which the DC-8 will navigate around the South Pole following an arc of -86 deg. latitude at an altitude of 35,000 feet. 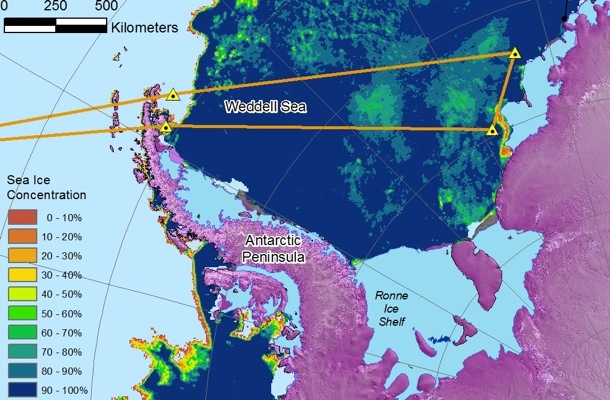 The South Pole arc will enable NASA’s Land, Vegetation and Ice Sensor (LVIS) to map the surface of the interior of the ice sheet with a 2-kilometer-wide swath, and 25-meter spatial resolution within the swath. This mission will extend the coverage around the pole first collected by LVIS during a 2009 mission. 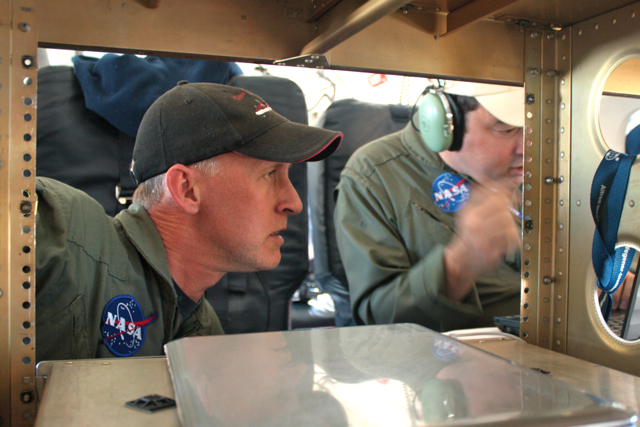 In addition to LVIS, NASA’s Digital Mapping System (DMS) will also be collecting data during this flight. 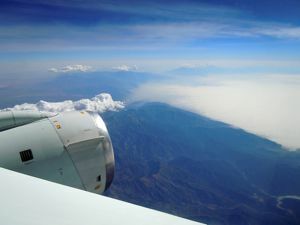 Two other instruments, NASA’s Airborne Topographic Mapper and Kansas University’s MCoRDS radar, typically operate only at lower altitudes, but today both are experimenting with new operational modes and equipment that may allow them to collect data from higher altitudes with LVIS. The LVIS surface height mapping data provide an important datum to calibrate measurements of ice sheet surface elevation obtained from the Ice Cloud and land Elevation Satellite (ICESat) laser altimeter. ICESat was in a near-polar orbit with the laser altimeter surface profiles densely converging in an arc around the south pole at -86 deg. Therefore, the swath of data LVIS is collecting today, along with that collected in the 2009 pole arc flight, intersects nearly 70 percent of ICESat orbits and provides over a million LVIS and ICESat difference observations for comparison. 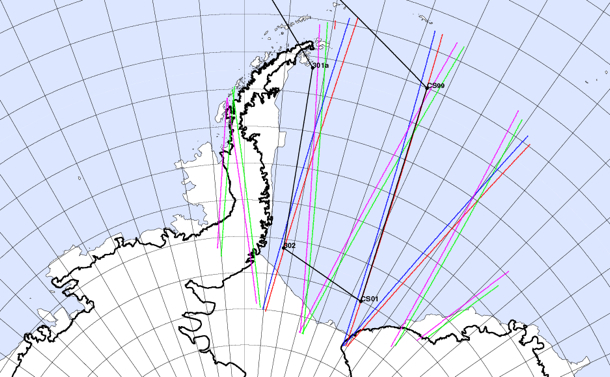 It’s a unique set of data leveraging the converging satellite tracks around the pole. In addition, the LVIS observations will provide an important datum to monitor long-term interior ice sheet change with respect to current and future near-polar satellite mission data. 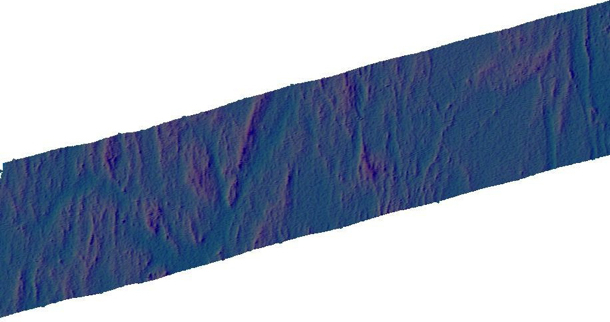 The DMS and MCoRDS systems complement and enhance the LVIS data by providing high-resolution surface imagery and bedrock topography respectively. Principal investigator Bryan Blair and scientist Michelle Hofton are running LVIS for today’s mission. Through the magic of technology, lead instrument engineer David Rabine is supporting the mission via xchat while he is on an airplane flying back to the United States after spending the previous three weeks in the field with the instrument. LVIS obtains measurements of surface height using a laser altimeter approach. A laser pulse is transmitted from the instrument, and is reflected back from the surface where the return pulse is recorded. The distance, or range from the instrument to the reflecting surface, is computed as the round trip time of flight of the pulse divided by two (to get the one-way travel time) and then divided by the speed of light. 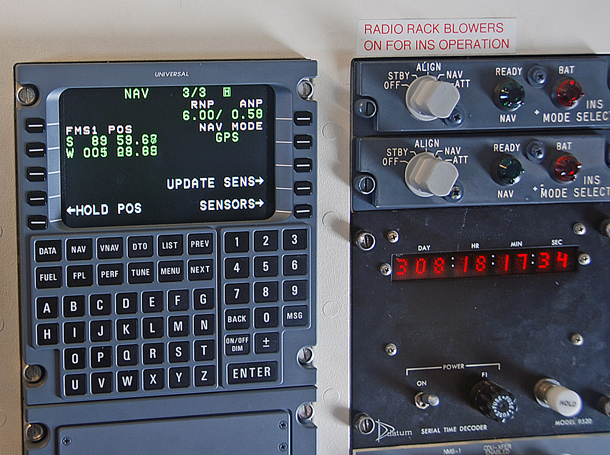 GPS receivers are used to compute the position of the instrument, while the pointing or direction of flight of the laser pulse is determined using instrument orientation data provided by a gyro attitude sensor. The surface elevation for each laser shot can then be computed from these data using the position of the instrument, the direction of the laser pulse travel and the distance or range of the laser pulse travel to the surface. Nearly 30 minutes into the flight the excitement ramped up as the pilots prepared to perform the LVIS instrument calibration maneuver. Everyone took their seats and strapped in. A few minutes later the go was given to perform the maneuver and the airplane pitched up and down several times followed by several rolls left and right, giving us all a roller coaster ride. After a few minutes all was clear and we were back to business. Now, over six hours into the mission we have completed the data collection for the pole arc and are heading back to Punta Arenas, Chile. On the transit back we flew directly over the South Pole! The mission was clearly a success with mostly clear skies and a full data collection from the instruments. Everyone is looking forward to getting on the ground, having a good dinner, and getting rested up for, potentially, another flight tomorrow. 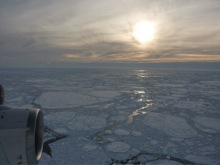 Dryden Flight Research Center, CA — Welcome to our 2010 Antarctic campaign with NASA’s DC-8 Flying Laboratory. 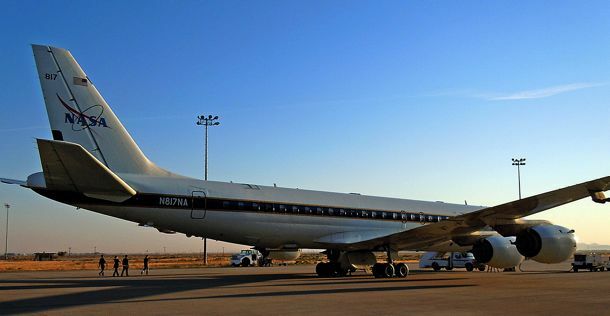 For the past two weeks Operation IceBridge teams have been busy installing instruments and sensors onto the DC-8 aircraft here in Palmdale, Calif., at NASA’s Dryden Flight Research Center. 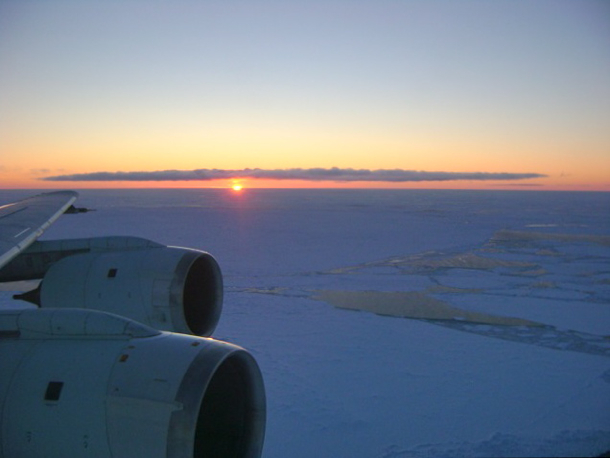 Over the next couple of weeks we will fly with the DC-8 over Antarctica to measure changes in thickness of the sea ice surrounding Antarctica and to monitor changes in the thickness of ice sheets and glaciers that cover 98% of the Antarctic continent. But before we can go south we have to go through a series of test flights here in California to make sure that all the installed sensors work and to calibrate our science instruments. In order to do this we fly over target sites in the Mojave Desert that we have surveyed on the ground a few days before the test flights. The desert environment that we have selected for our test flights here is very different from the barren land of snow and ice that we will be flying over the next couple of weeks and we all enjoy the low altitude flights over the Mojave Desert, the San Gabriel Mountains and the San Andreas Fault. When the pilots ask you if it would be a problem if the belly of the aircraft is facing the sun you know that you are in the world of research flying. We did a couple of 90 roll maneuvers at high altitude over the Pacific Ocean to calibrate the antennas of the ice-penetrating radar systems that we will use to survey sea ice, glaciers, and ice sheets. The IceBridge teams have enjoyed a few days of work here in warm and sunny California and we are now ready to fly to Punta Arenas in southern Chile, which will be the base of operation for our Antarctic flights. We are looking forward to another successful campaign with exciting new data and spectacular Antarctic scenery.